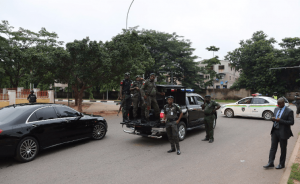 This Tuesday morning operatives from the Special Anti Robbery Squad unit of the Nigeria Police blocked the convoy of Senate President Bukola Saraki from leaving his Maitama Residence. The stern-looking policemen, it was learnt, stormed the residence at about 6:00a.m. and prevented vehicles from coming in or going out of the expansive residence of Nigeria’s third citizen.